A section of the new University of Guyana students at the orientation session held at the George Walcott Lecture Theatre on 27th August, 2018. University of Guyana Vice Chancellor, Professor Ivelaw Griffith has warned new students against stealing other people’s works and reproducing it as theirs to help create a culture of honesty as the country is poised to earn huge revenues. 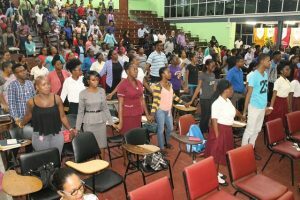 Addressing an orientation for the freshmen and women at the George Walcott Lecture Theatre on Monday afternoon, he warned them against plagiarism which is a global problem. “You are not allowed to plagiarise. Taking somebody else’s work, putting your name on it…That is not habituating excellence where you earn it so the value you want to practice is the value of integrity,” he said. The Vice Chancellor called on the new batch of students not to buy papers or ask previous students to assist you with their papers. “Everyone here has to practice the value of integrity. You are not allowed to go buying your paper to get an ‘A’. That is not practising the value of integrity. It’s not going to be a recipe for success,” he said. Griffith did not have any statistics about the number of reported cases of plagiarism. He said the institution has been using technology, such as https://www.turnitin.com/ to intercept and penalise plagiarists in an age where it is easy to copy other’s works from Google. Vice Chancellor, Professor Ivelaw Griffith addressing the 2018 Orientation exercise of the University of Guyana. “Technology makes it easy for people to plagiarise and so what we have begun to do now is to use technology to help to combat that plagiarism issue but it is partly an educational process,” he said, adding that the Library has been cautioning students against stealing other people’s works. 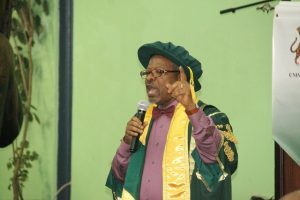 The Vice Chancellor urged the students not to be satisfied with partial success in some subjects. “Habituation of excellence is a value you want to be able to practice if you want to be successful,” he said. “It matters if you embrace and practice certain values that allow you to be successful,” he added.